Preheat oven to 400°F. Brown meat in large skillet on medium-high heat; drain. Stir in 1/2 cup of the salsa and the taco seasoning mix until well blended. 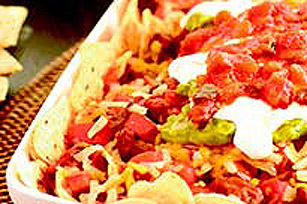 Place nacho chips in 9-inch square baking dish; top with layers of half each of the meat mixture, tomatoes and cheese. Repeat layers. Bake 8 min. or until cheese is melted; top with guacamole and sour cream. Serve with additional salsa, if desired. Prepare meat mixture ahead of time; cover and refrigerate until ready to use. Increase baking time as necessary until meat mixture is heated through and cheese is melted. This recipe is great for casual get-togethers. Be sure to stick to the serving size.